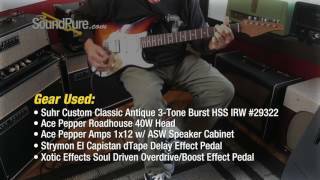 In this video, Sound Pure electric guitar specialist Eddie Berman tests out the Suhr Custom Classic Antique 3-Tone Burst HSS IRW #29322 with an Ace Pepper Roadhouse 40W Head, an Ace Pepper 1x12 w/ ASW Speaker Cabinet, a Strymon El Capistan dTape Delay Effect Pedal and a Xotic Effects Soul Driven Overdrive/Boost Effect Pedal. 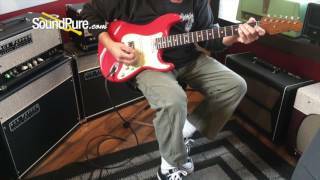 In this video, Sound Pure electric guitar specialist Eddie Berman tests out the Tuttle Tuned S Fiesta Red HSS Electric #434 with an Ace Pepper Roadhouse 40W Head, an Ace Pepper Amps 1x12 w/ ASW Speaker Cabinet, a Strymon El Capistan dTape Delay Effect Pedal, and a Xotic Effects Soul Driven Overdrive/Boost Effect Pedal. 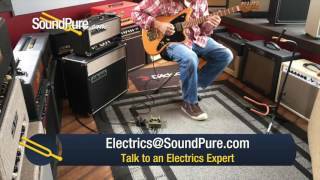 In this video, Sound Pure electric guitar specialist Eddie Berman tests out the Tuttle Tuned S Black HSS Electric #435 with an Ace Pepper Roadhouse 40W Head, an Ace Pepper Amps 1x12 w/ ASW Speaker Cabinet, a Strymon El Capistan dTape Delay Effect Pedal and a Xotic Effects Soul Driven Overdrive/Boost Effect Pedal. 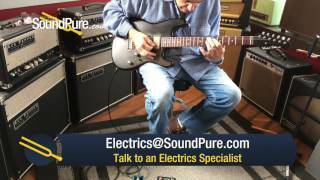 In this video, Sound Pure electric guitar specialist Eddie Berman tests out the Tuttle Custom Classic S Satin Black Over 3-Tone Burst #430 with an Ace Pepper Roadhouse 40W Head, an Ace Pepper Amps 1x12 w/ ASW Speaker Cabinet, a Strymon El Capistan dTape Delay Effect Pedal, and a Xotic Effects Soul Driven Overdrive/Boost Effect Pedal. 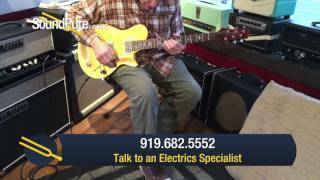 In this video, Sound Pure electric guitar specialist Eddie Berman tests out the McInturff TCM FLE Prototype Goldtop Electric #3025 (Used) with an Ace Pepper Super Sport 40W Amp Head, and an Ace Pepper Amps 1x12 w/ ASW Speaker Cabinet. 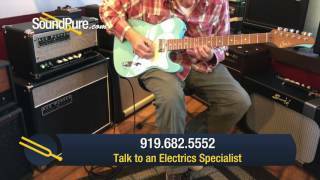 In this video, Sound Pure electric guitar specialist Eddie Berman tests out a used Suhr Custom Classic T Daphne Blue HH Electric with an Ace Pepper Super Sport 40W Head, an Ace Pepper 1x12 w/ ASW Speaker Cabinet, and a Strymon El Capistan dTape Delay Effect Pedal. 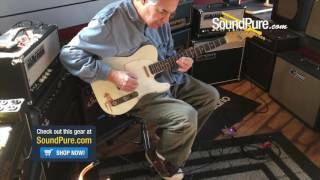 In this video, Sound Pure electric guitar specialist Eddie Berman tests out the Suhr Custom Classic Antique Trans White SSS #31328 with an Ace Pepper Super Sport 40W Head, an Ace Pepper Amps 1x12 w/ ASW Speaker Cabinet and a Strymon El Capistan dTape Delay Effect Pedal. 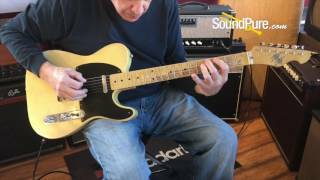 In this video, Sound Pure electric guitar specialist Eddie Berman tests out the Anderson Drop Top Natural Black to Dark Blue Burst #06-06-16A with an Ace Pepper Roadhouse 40W Head, an Ace Pepper 1x12 w/ ASW Speaker Cabinet, a Strymon El Capistan dTape Delay Effect Pedal and an Xact Tone Solutions Imperial Overdrive Guitar Pedal. 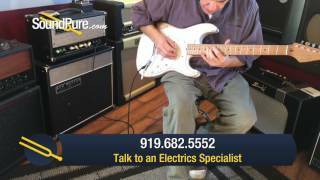 n this video, Sound Pure Electric Guitar Expert Eddie Berman demonstrates the Mario Martin T-Style Nocaster Blonde No. 1016217 played through the Ace Pepper Roadhouse 40W Head and Ace Pepper Amps 1x12 w/ ASW Speaker Cabinet. 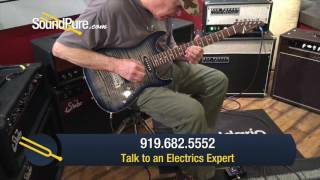 In this video, Sound Pure electric guitar expert Eddie Berman tests out the Mario Martin T-Style Olympic White Relic w/ Pinup #1116220 with an Ace Pepper Super Sport 40W Head, an Ace Pepper 1x12 w/ ASW Speaker Cabinet, a Strymon El Capistan dTape Delay Effect Pedal and an FX Engineering RAF Mirage Compressor Effect Pedal. 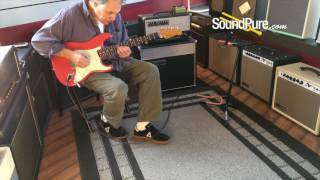 In this video Sound Pure electric guitar expert Eddie Berman tests out the Suhr Custom Classic Antique Fiesta Red SSS #27080 (USED) with an Ace Pepper Roadhouse 40W Head, an Ace Pepper Amps 1x12 w/ ASW Speaker Cabinet and a Strymon Brigadier dBucket Delay Effect Pedal. 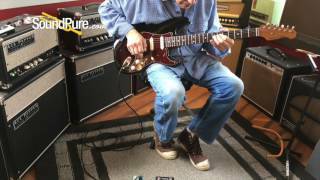 In this video, Sound Pure electric guitar expert Eddie Berman demonstrates the Tuttle J-Master Butterscotch Electric, using an Ace Pepper Roadhouse Amp, an Ace Pepper 1x12 Cab, a Strymon Brigadier dBucket Delay Effect Pedal and an Xact Tone Solutions Imperial Overdrive Guitar Pedal. How excited can you get about a speaker cabinet? It's just a box for the speaker, right? At Ace Pepper Custom Amps we beg to differ. When we set out to design our new Super Sport and Roadhouse amps we knew we needed something special to broadcast the amazing tone of our amps. So we worked closely with Will Dyke at Armadillo Amp Works to make a cabinet worthy of the Ace Pepper tone. We start with solid pine wood for light weight and resonant tone. Finger joint construction makes our cabinets durable for years of gigging. We also made our cabinets a bit deeper (10") than most 1x12s for a bigger sound from a small box. When deciding between open back and closed back, we came up with our unique "tuned back" design. The back panels are 1/2" thick and much larger than most cabinets. This forms a bass port in the back of the cabinet for, again, a bigger sound and deeper, richer lows. Our humble crew of geeks, freaks, and tone snobs declared this the best sounding 1x12" cabinet we've ever heard! My name is Ace Pepper. I came from a distant planet, many light years from Earth. My mother and father, along with billions of other people, were killed when our planet was destroyed. They sent me here to carry on their legacy and bring truth, justice, and the American way to all mankind. Unfortunately, I became a musician. I have been building tube guitar amps by hand in my little shop in San Marcos, Texas since 2000. I've built well over 100 amps since then. There have been quite a few boutique amp "companies" that have come and gone since then. I'm starting to look like an "old man" in this business. My customers are people you've never heard of with excellent taste in amplifiers. My amps start with a plain aluminum box, or chassis pan. I have these "pans" made to my specs by a local sheet metal shop with nice, thick aluminum and welded corners. Most of my amps are one-off, custom builds, so I really can't use "off-the-shelf" chassis. I'll mark, drill, and punch whatever holes are needed to mount whatever controls, tubes, transformers, etc. for the given build. I also make my own circuit boards. I use either turrets or eyelets to mount parts and the boards are made from Kryptonite, I mean G10 Garolite epoxy resin. Layouts are designed on the computer. Resistors, caps, wiring, etc. are then hand soldered in place. Head cabinets are made, you guessed it, by hand, by me, in my shop using Birch plywood. My wonderful wife does a wonderful job with tolex coverings. She's also done fabric finishes, like tie-dyed cotton or aloha shirt, with a tough epoxy resin final finish. We've also worked with some terriffic painters for show-quality custom paint finishes. We work with Will Dyke at Armadillo Amp Works for custom combo cabinets. Will's cabs are the best in the biz, made from solid pine with finger-jointed corners. They are the good stuff! When you order an amp from Ace Pepper Custom Amps you are dealing directly with the builder at every stage of the process. Each amp is made for the individual that ordered it. You can talk to me about stuff like "I'd like a little more headroom", or "Can I have more mids?". My warranty covers tweaks to the tone! Who else does that? Nobody!! Why fool with something that's just "close" when you can work with an experienced builder to get EXACTLY what YOU want!